Fireplaces and fire pits exude an old-world, romantic charm to any area. Trust a fireplace and fire pit to warm the coldest winter. They can also add life and vibrancy to an outdoor party or serve as areas where your friends and loved ones gather around campfire style. Fireplaces installed inside your home or outdoors allow you to save more on your electric bills. The heat that comes from this feature is enough to warm a room where you and your family can snuggle together as you share the day's events during cold winter nights. Fireplace and Fire Pit Installed in the patio, the fireplace and fire pit will make it possible for you to enjoy warm summer nights outdoors and even during winter. In an outdoor kitchen, these features can both act as stoves or roasters, as well as the focal point, which you and your friends can quietly admire. So you're all geared up to have a fireplace and a fire pit installed in your home? Before you buy pre-fabricated ones or hire the services of contractors, here are a few things that you might like to consider. Space. Just how much space can you allot for your fireplace or fire pit? Do you want to have them indoors or outdoors? Number of People. How many people do you wish to entertain? Because of their structure, fireplaces are for romantic, cozy get-togethers; while fire pits allow roasting and fun activities. Safety. Fireplaces have chimneys where smoke can pass through; while fire pits can spew smoke and embers everywhere. But this can be prevented with properly built fire pits. Materials. What type of material would you like your fireplace and fire pit to be made of? The most popular are: copper, cast aluminum, cast iron, and clay, each having a certain characteristic that makes it ideal material for fireplaces and fire pits. The choice is yours. At Mike's Lawn & Garden, your safety and satisfaction are our priority. We only use premium materials and pre-built products from our reputable partners who will stop at nothing to give you the best and safest materials for your fireplace and fire pit. 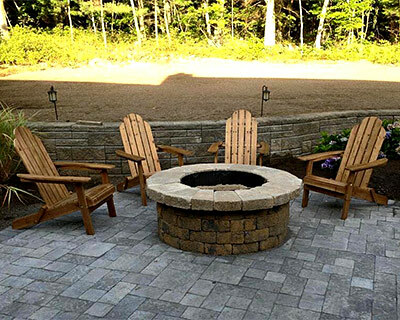 Fireplace and Fire Pit With Pavestones as one of our trusted suppliers, you can be assured that you can have your desired fireplace and fire pit installed right on time. They have different designs to choose from, depending on your needs and wants. 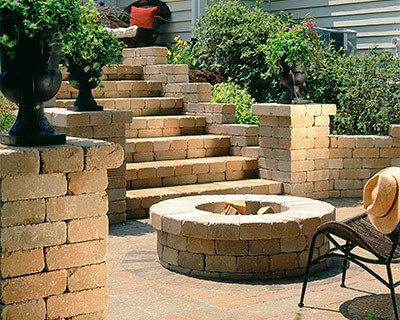 We are also affiliated with Belgard Hardscapes, which can give you a unique line of outdoor fireplaces that can enhance the beauty of your backyard, patio, or deck with their top-brass but economical fireplace products. Our team is made up of creative experts who have undergone intensive seminars and workshops, as well as extensive experience in installing fireplaces and fire pits. We service Bristol and Plymouth Counties in Massachusetts and Kent, Newport, Providence, and Washington Counties in Rhode Island. So when it comes to fireplaces and fire pits, trust Mike's Lawn and Garden, and you can never go wrong.